A team of Humboldt State students launched SpaceUse, open source software designed to record Library seating information on a tablet and quickly produce data reports. Behind recent changes and renovations in the HSU Library have been stacks on stacks of data. To calculate how (and how often) people used space, library staff manually tallied data based on reams of surveys filled out by students and examined stacks of floor and furniture maps. Seeking help to streamline the process, Library Dean Cyril Oberlander and Information Technology Services compiled a team in 2017, hiring Computer Science majors Sam Alston, Eric Mott, and Ben Miller. In one semester, they launched SpaceUse, open source software designed to record seating information on a tablet and quickly produce reports on the data. Miller and Mott are trying to expand its use among other institutions. They also hope to commercialize the software and expand its features. When Oberlander began to envision changes to the library, expanding open spaces and creating a more inclusive and welcoming space, he knew he’d need data to guide the process. Since 2015, the library has been conducting space use surveys, walking all three floors of the library, observing where people are sitting, the type of furniture and space they’re in, and whether they were studying on their own or collaboratively. These seating use surveys helped determine what types of furniture made the most sense in certain parts of the library: They discovered, for example, that couches in the Library Café were used as infrequently as the microfilm readers, so they were replaced with much more popular café tables. But those surveys were paper-intensive and time-consuming, and comparing the results was arduous. Now with SpaceUse, users can upload floor plans for any building and designate areas and rooms they’d like to survey. Then, they can place furniture on the plan, noting its shape, how many seats it has, and other features. As a surveyor walks around the Library, they can note how many people are using each piece of furniture on the plan, and even indicate where furniture has been moved to reveal patterns of preference – data that informs design decisions. Oberlander says the software has made it much faster to survey seating—between 10 and 30 minutes, now, and surveyors are gathering more specific data. Students and staff surveyors are excited to use the software to conduct the surveys, as well as, while the recording function has improved efficiency, it’s the results that count. “The reporting function is the bread and butter of this software,” Miller says. Users can select a survey from any point in time, and see an average population, percentage peaks, and more for any area or piece of furniture. They can also compare to other points in time. This has given Oberlander the ability to quickly adapt spaces for students’ needs. 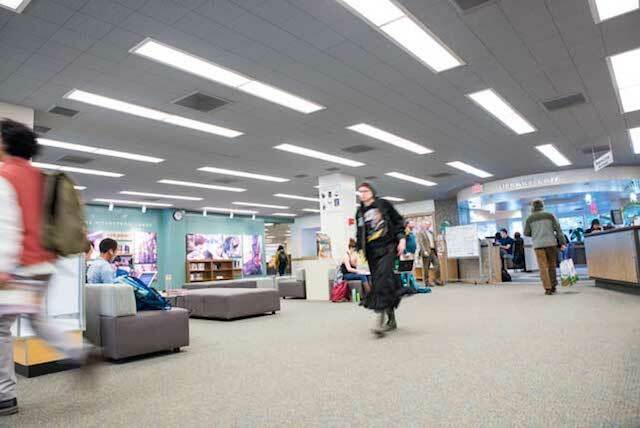 “How we shape the library space focuses on how students learn best and we now have a clear picture of where we can enhance their learning environment,” he says.